The application for 32 houses on Hawarden Road was refused planning permission by Flintshire's planning committee in September, against the recommendation of the planning department. The developer appealed the decision. At Decembers' planning committee, the press and public were excluded while the planning officers, legal advisers and planning committee discussed the appeal behind closed doors. We do not know what was said, but Flintshire County Council decided afterwards not to contest the appeal. The planning department don't see any harm in more housing in Penyffordd despite being told by the schools team that there are no school places at Ysgol Penyffordd or Castell Alun and despite the objections from the community and the Community Place Plan. Because of the number of objections (165 residents objected), the Planning Inspectorate decided that the appeal should be determined by Public Inquiry. Because Flintshire are not contesting the appeal, we assume that the appellant will be presenting their case to persuade the inspector to overturn the committee's decision. We will be trying to persuade the inspector that the decision was right. 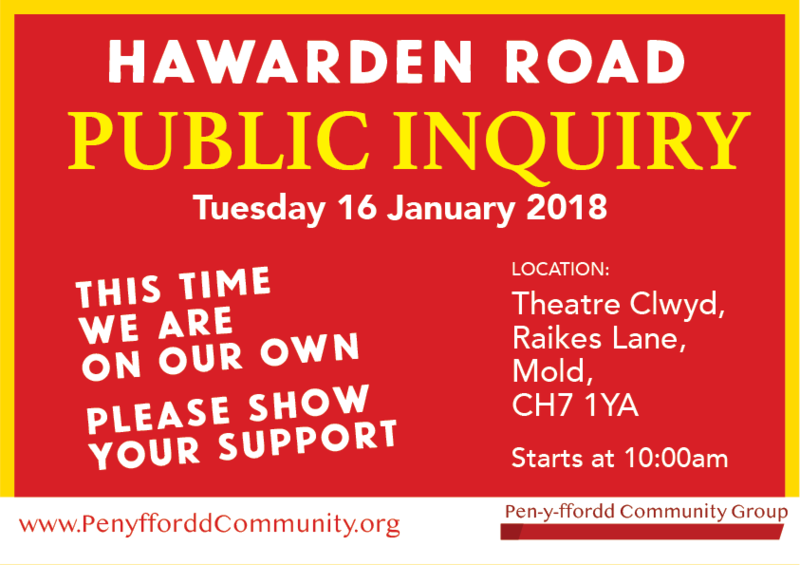 Theatre Clwyd is not the best venue in January but anyone who can spare the time to go to Mold would be most welcome - we need a show of support, we are fighting for our community. 2. On principle. Penyffordd is Flintshire's fastest growing community - we have had more houses % than any other town or village in Flintshire in the last 15 years. 3. The schools are full. That's a fact and it will only get worse. The outcome is that the village will be split with Penyffordd children attending Castell Alun and Penymynydd children attending Elfed Buckley. 5. We still don't know the outcome of the Redrow inquiry - that could mean 186 more houses too. If you're worried about more housing, the Council are planning to build 24 affordable dwellings in Dobshill on the old Council depot site.